“The Dutch label Otrabanda is excellent at compilations from lesser known genres… This time from the coast of Colombia…a great variety of marvelous polyrhythms…steaming grooves… There are country songs on this CD, relatively simple religious chants, for instance, but also urban tracks, with deft arrangements. Grand masters of the past are honored, but modern-day genres are also embraced”. Latin avant la letter in its most vital form”. “You step right in Colombian music scene, in particular in the melting pot of Buenaventura. Like in other ports such as Havana, Dakar and Accra, breeding ground for the splendid cross-overs. A natural fusion of native polyrhythm with music from overseas, tradition with modernity…a fascinating travel guide and dance album in one”. “This collection has a personal down-home feeling a little piece of Ghanaian cultural history that warmly evokes those cooking nights in the Bokoor studio as the congas and shekeres (gourds) meted out the rhythm, and guitarists and singers danced around purely to their own delight”. “These Bokoor versions are joyously funky, with male-female, vocal cross talk, chicken-scratch rhythm guitar, searing harmonica filling in for the brass section, and deep pocket grooves… Detailed sleeve notes help make this a must-own edition for collectors of music from Ghana’s golden age of guitar pop music”. “The subtle and overt become sublime in these twelve dance tracks that stand the test of time on club sound systems. The analog, gritty flavor adds ambiance, for one can only imagine the hypnotic frenzy these players were engulfed by during those memorable sessions at this small studio in Ghana. And remembered they shall be: it was Ghana¹s musical satellite to the outside world, one still beaming broadcasts anywhere ears are open to listen”. “Too often, enthusiasts of African music from the ’60s and ’70s focus on the sounds trickling out of Lagos and Johannesburg as if the barometer for continental coolness depended solely on Nigeria and South Africa. There were dozens of good musical styles emanating from those two hotbeds during that time period, but thankfully, the folks at Otrabanda Records chose to explore the funk vaults in Ghana and discovered a bevy of musical gems along the way. The recently released Bokoor Beats is an eye-opening representation of the overlooked highlife and Afropop sounds of Accra. The tunes on this 12-track collection are mellower and slightly more jazz-driven than, say, Fela Kuti’s Afrobeat, but there’s a richness to these dug-up recordings that permeates like an audible treat for lovers of obscure West African rock/funk”. “American music – especially R&B, rap, and hip-hop – continues to exert massive influence on African pop music. If you turn on the radio in Accra today, you are likely to hear the contemporary “hiplife” style, a Ghanaian fusion of “highlife” and hip-hop. Hiplife certainly has its appeal, but the music on Bokoor Beats feels deeper. The pride and confidence of independence – which Ghana won in 1957 – still dominates. These bands are certainly plugged into the world, but their sound forcefully puts Africa in the mix. There is no turning back the clock on music, any more than on history itself. Thankfully, there are retrospective CDs like Bokoor Beats, a brand of nostalgia that is easy to share, even if you did not live it the first time around”. “…a fascinating retrospective of one of the legends of Curaçaoan music… a fine introduction to Chin’s work, a catalog of old and new classics underpinned by his swinging, salsa-infected groove. The Beat…performs a balmy, engaging mix of bolero, tumba, calypso and Antillean sehú, with topical lyrics in Papiamento… Guest Izaline Calister joins for two scintillating vocal duets”. “Rhythmology is a groove feast, amply showing Ayivor’s punch-packing might on assorted hand percussions as well as drum set…in addition to being a highly skilled and gracious player, Ayivor was and is very much an innovator…there’s an African pulse flowing through everything on this celebratory disc…so dance, play along or simply listen. It’s a first- rate party to which all are invited”. “Kofi Ayivor is clearly a technically great percussionist; Rhythmology demonstrates that he’s also a versatile musical explorer with some tremendously creative ideas”. “This survey of his contains a wealth of breathtakingly dexterous, varied and expressive drumming”. “A master drummer and percussionist, Kofi Ayivor is another heavyweight of African music…There is not a corner of the world his music has not touched, and we can finally say this is a true ‘world ‘musician…Enjoy and remember – this is one of the legends of the past”. “The album is dynamic, busy, vivid and – some achievement this, on drums, – paints a warm, humane picture of the artist”. “Colombia’s Atlantic coast has long been a fertile breeding ground for new musical styles: cumbia and vallenato are just two of the region’s well known exports. But, separated by the isthmus of Panama, the Pacific coast has plenty to offer as well. Take Enrique Urbano Tenioro, a.k.a. Peregoyo, the 87-year-old pioneer of currulao, the rollicking, African derived dance music that grew up in the Pacific port city of Buenaventura. Peregoyo may be familiar to salsa aficionados for his 1970s contributions to salsa typical, but at home he and his Combo Vacaná are best known for this irresistible carnival music. This rootsy set, their first new recording in more than 30 years, combines call-and-response vocals with blaring, salsa-style trumpets, a chugging sax and a battery of funky hand-percussion instruments (driven primarily by the implacable guaracha scraper). Lyrically, the songs offer joyous shoutouts to such coastal pleasures as women, iguanas, and dog soup. Still, scorchers like “La Tintoretta” and “Mi Timbiqui” make El Rey del Currulao well worth the 30-year wait”. “Thirty years later, on “El rey del currulao” this renowned Colombian orchestra carry on like a band of exuberant young dogs. Their mix of African rhythm with a sharp Latin touch still remains irresistible. Driving dance music characterized by a buoyant simplicity sprinkled with rippling sax solos… At the same time this comeback album illustrates the mix of styles that a creolized country like Colombia yields. Yet Peregoyo refers to the currulao-style as ‘the mother of all local rhythms. Peregoyo has even managed to transform the Duke Ellington standard ‘Caravan’ into a spine tingling Latin hit. This is an unrelenting dance album that can play on all summer long”. “This new release constitutes a superb introduction to the contemporary configuration of Afro-Colombian music”. “…raw, rootsy currulao feel… the CD comes with excellent liner notes in Spanish and English…It’s worth getting just for the final track, a reworking of Duke Ellington’s ‘Caravan’ with a guitar intro that Ry Cooder would be proud of”. “A fresh musical breeze from the Caribbean… lyrical, with an unmistakable lilt and a distinctive fusion of elements from the island’s past with those of today’s Caribbean and adjacent Latin American coastline… Serenada close the album with a profound African-style blues about a year of misery and poverty, sung by an unnamed artist as powerful as Virginia Rodrigues or Cesaria Evora”. “Their polyphonic arrangements resonate with the work of Cuba’s Vocal Sampling and Grupo Vocal Desandann”. “… this 10-piece group merges smooth group choral arrangements with percussion and sparse guitar/cuatro/bass accompaniment, often reinventing Papiamento folk classics of an earlier era and revealing the African, European and regional Caribbean ingredients that over the decades and centuries have gone into shaping the music… these always understated and beautiful harmonies…are at times punctuated with the kind of vocal onomatopoeia that one might expect to hear from Lady Blacksmith Mombazo”. “Lovingly restored and extensively annotated not only is [Riba Dempel] a delicious compilation of songs but also a fascinating insight into a bygone era… there is music here of a high level”. “Another piece of the puzzle shows up: the music of Curaçao runs the Caribbean, using its own local rhythms along with copious quantities of son from Cuba and music from Venezuela…it’s a model of how historical recordings should be treated”. There is some totally incredible music here, in fact it is a complete revelation, superb vocals, sharp compositions and snappy arrangements…Apart from the perfectly chosen tracks there is a comprehensive booklet with the full history of the music, the musicians and main players…’Riba Dempel’ is going to echo around my life a lot in the coming year and beyond, it is an essential listen because of the quality of the music and also the ability to put curaçao music into it’s proper position in the history of Caribbean music”. “Mais l’attrait indéniable de cas deux remisassions tient assurément à l’etrargoté du dialecte utilisé, le papiamentu, formidable créolisation à basa d’anglais, d’espagnol, de portugais et de néerlandais dont la richesse musical est un enchantement. Et outre, il faut saluer le travail éditorial d’Otrabanda, notamment la haute tenue des livrets qui sont à eux seuls des modèles chose sur ce petit pays si discret. Les amateurs de musiques caraïbes ne devraient pas passer à côté de ces deux réalisations épatantes”. “Beautifully packaged and with excellent liner notes by Collins, Vintage Palmwine is a vibrant document of a popular music style that was once ubiquitous in Ghana but is fast dying out”. “Luscious, rustic, wistful numbers that evoke summer daydreaming. The small, independent Otrabanda Records, has provided this collection with its usual excellent liner notes”. “Drowsy afternoon music, a uniquely warm thing, the Otrabanda release gives an hour’s worth of lo-fi euphoria from three of the palmwine greats…nimble guitar figures, light percussion and voice, pure pleasure”. 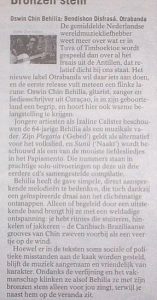 “Behilia has the gift of composing simple, directly appealing melodies…whether solo or accompanied by an excellent band his relaxed delivery has a salutary effect, you’ve got rhythms here that bounce, skip or drive along – Chin’s Caribbean-Brazilian grooves float past like a feather on the breeze”. “The title track “Bendishon disfrasá “is a real nice groove tune with experience tinged vocals from Oswin. A very interesting release altogether, if you need a new fix of roots from a different quarter then certainly check out Oswin”. “En toute sobriété, il retricote les champêtres alliages de guitares, de voix et de percussions de l’Oriente cubain, avec un savoureuse fraîcheur”.